All 7 Lord and Taylor promo codes have been verified and tested today! Big savings are heading your way with email notifications. Subscribe to the Lord & Taylor newsletter to receive information on all the latest trends, special events happening in-store, and the best Lord & Taylor coupons. You’ll even receive email subscriber benefits when you sign-up, including priority access to sales and events, updates on the latest trends, and priority access to shop must-have brands. All you need to do is enter your email address, first and last name, zip code, and birthdate. Always on the go? Get Lord & Taylor discounts straight to your phone with text notifications. Text alerts often include exclusive savings passes. Sign-up with your phone number and you’ll never miss another Lord & Taylor deal ever again. Why pay for shipping when you don’t have to? All orders over $99 automatically receive free shipping without having to apply a special code. If you’re ordering beauty products, you only need to spend over $49 to get your items shipped to you absolutely free. Stay on the look-out for coupons that feature free shipping with no minimum purchase. These coupons pop up often and you wouldn’t want to miss a single one. Stay up-to-date on the latest style trends while getting the biggest sale updates on all of your favorite social media platforms. Prepare to be inspired by all the newest collections and start dreaming about your next outfit purchase. What makes it better is that you’ll get notified about all the Lord & Taylor discounts happening now. You can find Lord & Taylor on Facebook, Twitter, Instagram - and even Youtube, Pinterest and Tumblr. Shopping for yourself can be hard sometimes. Take advantage of the Lord & Taylor Personal Shopper program. They will help you find the trendiest styles that fit you perfectly, so you can stop wasting money on clothes that you’ll never wear. Contact them in person, over the phone, or via email and live chat. You’ll receive a personalized appointment customized to your needs in-store or over the phone. Plus, they can help you with gift recommendations. Ready to save in style? When you use Lord & Taylor coupons, you can save big on all your favorite styles, brands, and fashions. Don’t get stuck paying full price when there are deals everywhere you look. Want to make the most of your Lord & Taylor orders? Start earning rewards and getting benefits from all of your purchases. You can redeem your rewards by entering the Lord & Taylor promo code online at checkout or in-store by presenting your email. Are you a true bargain hunter? You could be getting a lower price on your next order without even using a Lord & Taylor coupon code. Lord & Taylor wants to make sure you are getting the absolute best price around, that’s why it has price matching! You don’t need to worry if you see the same item for a lower price at another store. Even if the item is on sale, Lord & Taylor will still match the competitor's sale price. Everything is fair game - from business attire to your next cocktail party outfit and even home appliances. No matter what it is, you could get it for less. Even if you have already purchased the product but find it cheaper at a qualifying US-based competitor within 7 days, Lord & Taylor will still adjust the price. Simply contact the Lord & Taylor Customer Service team for assistance. Want to start saving but don’t know how to apply a Lord & Taylor promo code? Don’t worry, it’s simple. 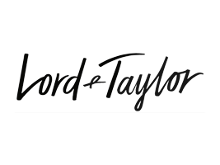 There are always Lord & Taylor discount codes available, so remember to keep looking to see what items you could save on.